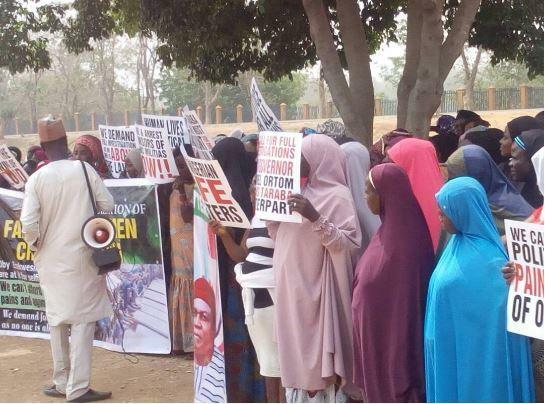 Protesters numbering over 500, Thursday, shutdown the capital city of Abuja, in protest of the protracted clashes between farmers and herdsmen, which have resulted to the deaths of many Nigerians in Benue and Taraba States and other parts of the country. The group, under the aegis of Good Governance and Transparency Initiative, is demanding the Nigerian government as well as the international community to urgently wade into the foot-dragging crises, which have rendered many citizens homeless and bereaved. 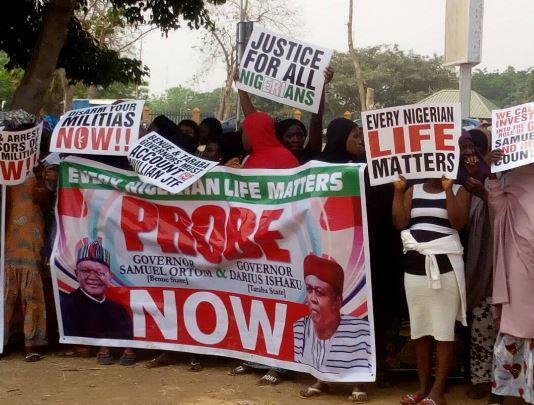 The protesters, who were seen displaying placards, bearing various inscriptions, called for the urgent probe of governors Samuel Ortom of Benue and Darius Ishaku of Taraba States over the attacks. Speaking on behalf of the group, Mrs. Jaiyeola Mohammed, the Executive Director, said the attitudes of Ortom and Ishiaku speak volume, a clear case of hand of Esau but voice of Jacob. Mohammed alleged that Ortom, especially has using the state’s resources to cover up his mess by sponsoring protests abroad. According to the group, “Our bigger worry, however, is the inaction that has continued to allow attention to focus on the wrong sources of the crisis. There is so much of playing the ostrich going on while the crisis festers. Our thoughts are that the problem in Benue state would have been contained to that geographical entity and promptly dealt with to save other states from suffering the fallout of a politically and ethnically motivated crisis. ” A killing related to the crisis in Benue has been reported in Ekiti while Taraba, Nasarawa, Plateau and even Kaduna are practically on edge because of what has happened in that state. “It is most unfortunate that instead of accepting reality and admitting what he did wrong to provoke the current crisis, Governor Ortom has rather engaged in looking at the cause of the problem in every other place except within himself. 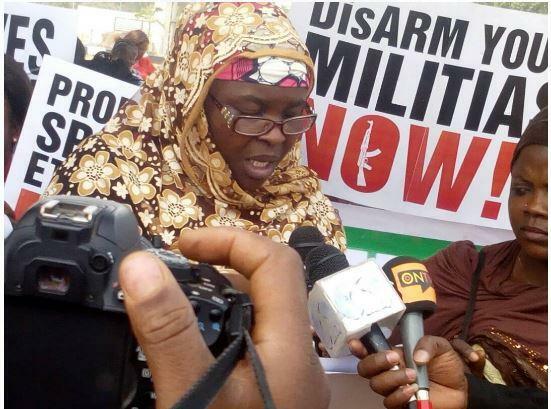 “This is despite the barrage of documentary evidence of him setting up militias and placing firearms in their arms to kill herdsmen. He is yet to explain what he stands to gain from the deaths of Benue people that he knew would definitely result from reprisals from the activities of his militias. “The Benue state governor has even taken things a step further by deploying N1 billion of his state’s fund to finance protests in major cities of the world as we earlier alerted. Not even the shame of being discovered as manipulating events was enough to dissuade this governor from this folly. Our concern is how a state governor could spend so much of his state’s resources on just eight (8) protesters in the United States. We then wonder how much he has spent on the hundreds of militias he has organized and how much he has expended on their weapons. 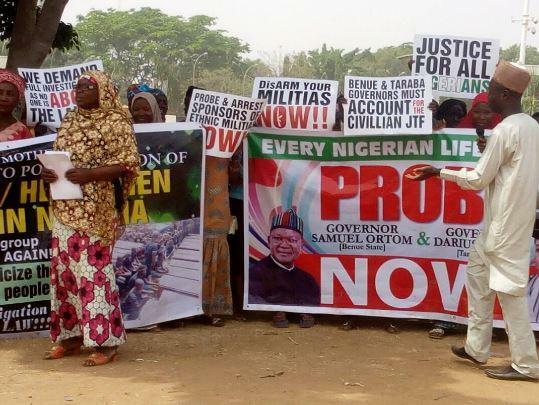 “Our group is interested in the peaceful resolution of the conflict between herdsmen and farmers, which is why we are staging this protest to demand a full investigation of the roles of the Governor of Benue State, Mr. Samuel Ortom and his Taraba state counterpart, Mr. Darius Dickson Ishiaku in sponsoring ethnic militias to wipe out people of Fulani origin. “Only such investigation would reveal facts that will prevent a full descent into state sponsored ethnic cleansing that has repercussions for all ethnic nationalities in Nigeria. The post Herdsmen: Group storms Abuja, calls for immediate probe of Ortom, Ishiaku appeared first on Vanguard News.